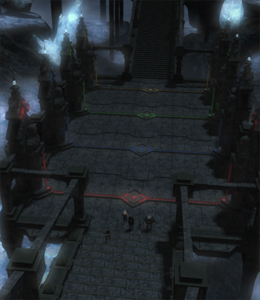 The Crystal Tower is the 1st 24 man raid available in Final Fantasy XIV, so of course you want to check it out, right? To get into the Crystal you have to first finish some quests and a couple of FATES to unlock it. It may sound a bit much, but it really doesn't take long and it gives a little story development on the Tower. The Tower is guarded by 4 potent elemental defenses which will need to be circumvented before you can enter. The elements can be reflected by crystals of sufficient clarity that each of the four Beast Tribes carry. You are asked to acquire these crystals first and report back to Rammbroes. This is where you begin the waiting game for the FATES. When patch 2.1 first launched the FATES had a really long respawn timer, but as of 12/19/2013, the timers will be greatly reduced during a maintenance period. Teleport to Camp Overlook in Outer La Noscea and go to the U'ghamaro Mines (23,28) to participate in a FATE called "Stopping the Shakes" to obtain the Earth crystal. Teleport to Aleport in Western La Noscea and to the Sapsa Spawning Grounds (16,15) to participate in a FATE called "Making Waves" to obtain the Water crystal. Return back to Rambroes and give him the crystals, you now must complete two more FATES to obtain the Fire and Wind crystals! Teleport to Forgotten Springs in Southern Thanalan and go to Zahar'ak (26,24) to participate in a FATE called "He's a Firestarter" to obtain the Fire crystal. Teleport to Dragonhead in Coerthas Central Highlands and go to Natalan (34,20) to participate in a FATE called "The Storm Caller" to obtain the Wind crystal. Finally turn in the quest "Legacy of Allag". Now you learn that you must collect 4 different types of aetheral sand! Isn't this fun...? Accept the quest "Sanding it Down" from Rammbroes in Mor Dhona (30,12) and teleport to Ul'dah and go directly to the Goldsmiths' guild. Travel to Camp Blufrog in Northern Thanalan (21,29) and speak to the NPC "Experienced Adventurer"
Turn in "Sanding it Down" and accept "A Performance for the Ages" from Rammbroes in Mor Dhona (30,12) and teleport to Gridania to visit Parsemontret in the markets. Brilliant, was spot on every step. made it in under 2 hours as a WHM, for atleast 2 of the FATES you should have some DPS help, but i got lucky and some ppl showed up.